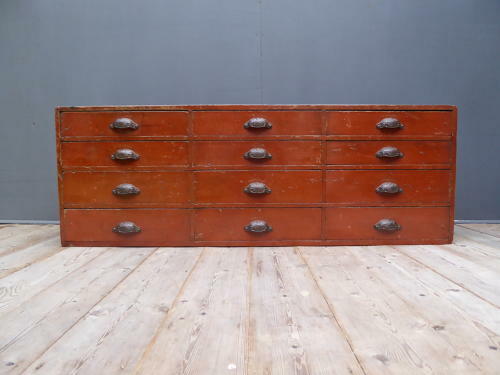 A beautiful bank of antique English pine apothecary drawers. A stunning & exceptionally original piece with twelve drawers all retaining their ornate cast iron cup handles. In its original painted finish boasting a wonderful age related patina with two deeper drawers on the bottom & two slightly more shallow along the top. Featuring the usual high quality build you come to associate with antique chemist fittings, all joints are dovetailed & the timber back is all original. A truly exceptional example. Wear commensurate with age, exceptional overall condition showing the usual signs of age. UK courier service available at £ tracked & signed for 48 hour delivery.